Welcome to Splash Studio, where visual communication comes to life. 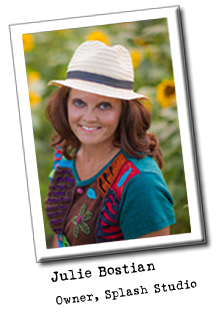 Splash Studio, owned and operated by Julie Bostian (that's me), consistently strives to impress clients and takes great pride in every project. I'm a graduate of the University of South Carolina, Columbia, with a BA degree in Journalism and Mass Communications, emphasizing in Advertising/Public Relations. Following college, I began working in the PR department at the Myrtle Beach Area Chamber of Commerce, in Myrtle Beach, SC. I went on to manage the chamber's graphic design and web design departments. 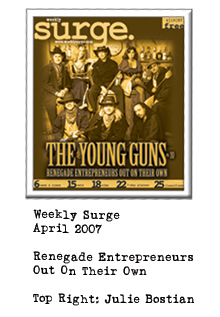 Ten years later, I took a leap and departed the chamber environment and stepped out on my own to give more attention to a growing Splash Studio, my then part-time freelance graphic and web design business. 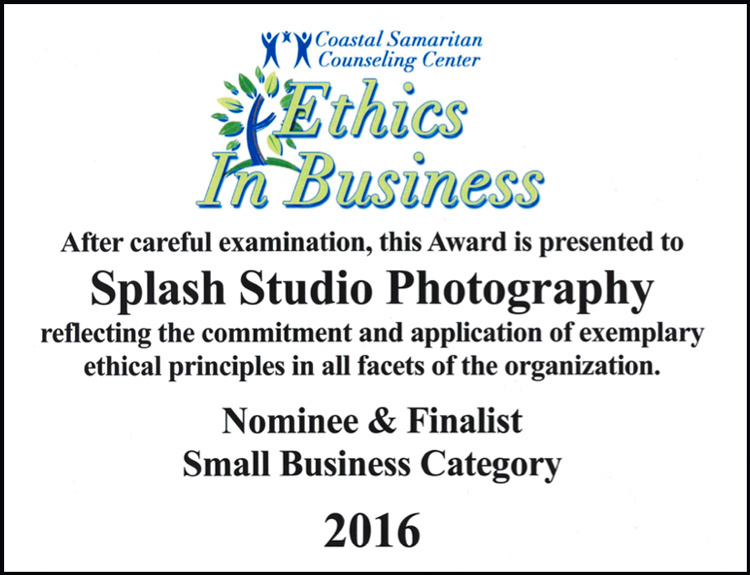 Photography is also a large part of Splash Studio. My love of photography began at age seven when I received a Keystone 110 camera for my birthday. Thanks mom and dad! A few years later I thought it was a spectacular upgrade when I was given a Kodak Disc 8000 camera (it had a digital clock on the front, WOW!). In addition to graphic and web design, I concentrate on portraits (families, couples, maternity, newborns, children, high school seniors, etc. ), real estate photography, and travel photography. Visit SplashStudioPhotography.com for more information on photography services and portfolio. How did the name Splash Studio originate? When I'm not behind the computer or camera, I'm kayaking, scuba diving, swimming, wakeboarding or anything else I can think of to get in the water. I'm scared of fireworks. I've placed 1st, 2nd, and 3rd place in a few surf kayak rodeos. I've completed several mud runs. I like my eggs well well well done, I'm addicted to lip balm. I'm a sea turtle hatchling whisperer. I've been swarmed by sharks while scuba diving. I've jumped out of a perfectly good plane. And my one and only hot air balloon ride crash landed (as gently as possible) in a field while the wind drug us along in the dirt for a while. 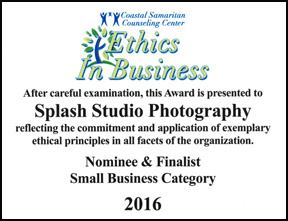 Splash Studio Photography was a Nominee and Finalist in the 2016 Coastal Samaritan Ethics in Business Awards.